At a 1931 barnstorming exhibition game in Tennessee, a seventeen-year-old pitcher for the Chattanooga Lookouts struck out Babe Ruth and Lou Gehrig back to back. Her name was Jackie Mitchell-'organized baseball's first girl pitcher.' On September 9, 1965, Sandy Koufax made baseball history by pitching his fourth perfect game. In July 1970, a stripper rushed onto the field at Riverfront Stadium to kiss Johnny Bench, temporarily disrupting a game attended by President Nixon and his family. 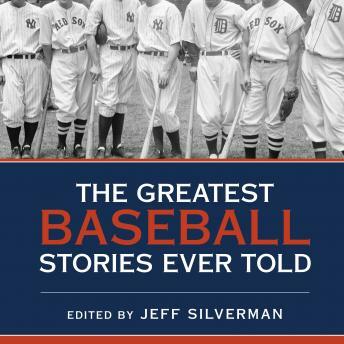 These are just some of the great, quirky, and comic moments in the annals of baseball recorded in The Greatest Baseball Stories Ever Told. Here also are profiles of such legendary figures as Joe DiMaggio, Pete Rose, and Yogi Berra, essays that explore the complexities and pleasures of the game, even an excerpt from the movie Bull Durham. This is the perfect book for anyone who has ever played so much as a game of catch.